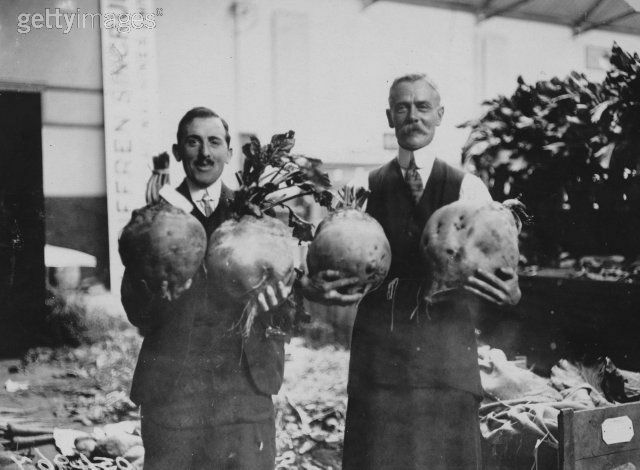 These old-timers appear to be very pleased with their enormous beet roots, and well they should be. 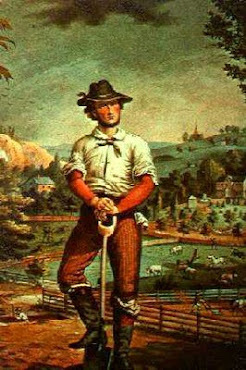 The great, and perhaps the greatest, defect in our New England agriculture, is the small extent devoted to the culture of roots. It is no doubt true that in a climate like ours, where stall feeding for five or six months in a year is a necessity which nature imposes upon us, the grass crop must be our main reliance for the feeding and nourishment of stock. Still, we need something more. Even if it were only for a change of food, as a sort of condiment, a supplement to the regular feeding, we should find a more extended cultivation of roots judicious and economical. But apart from their importance in this respect, it can be shown, we think, that a greater amount of nutriment can be raised from an acre of well-cultivated roots, be they English turnips, Swedes, or mangolds, than can be raised from an acre of grass. It may not be generally known that even horses soon become very fond of Swedish turnips, and that they thrive upon them as well as carrots, while the cost of raising them is undoubtedly far less, bushel for bushel. It is not necessary, in this connection, to cite instances to show how many tons can be raised upon a given space of land, nor to compare the nutritive value of these roots with that of hay, which might easily be done. 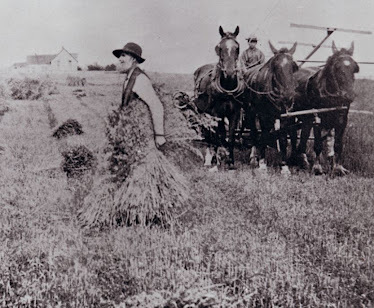 The yield of the Swede and the mangold, under good cultivation, and on a suitable soil, is often enormous, and generally, it may be stated, as vastly superior, when its nutritive value is considered, to that of any crop of hay ever raised on the same extent of land. Swedes and mangolds, therefore, must be regarded as among the most important and valuable of the root crops, and those most worthy of the attention of every farmer. These plants require very different cultivation and treatment. For the former, take a warm piece of light land which has been in grass from some years, and on which the water is not likely to stand for want of drainage, and plough it deeply, about the middle of June, turning in the grass, and then spread on a little well-rotted barnyard manure, and harrow it in with a good harrow,—for this purpose we consider Share’s harrow as the best,—and then mark out the rows with a marker, about twenty-eight inches apart, and scatter a little superphosphate, bone, ashes, or other concentrated phosphatic manure in the rows or drills, at the rate of three or four hundred pounds to the acre. This may be sown by hand in the rows. Then sow the seed in these rows with a seed-sower that will cover the seed well. These are the main points to be observed. Avoid strong nitrogenous or ammoniacal manures. They cause the plant to run to tops, and make large tops and long necks at the expense of the root, which is the main thing you want in the cultivation of this crop. [The Swede] wants a light, warm soil; it wants no forcing or over-stimulating manure; it wants clean culture, and plenty of room to grow without being crowded. Now the mangold is quite different. It needs to be sown much earlier, for it requires a longer time to grow. It does best on good, strong, stiff soil, well cultivated, and full of manure left and retained in the soil by previous cultivation. Land that will easily bear three tons of hay to the acre is none too good for it. Plough it early in May. Put it in as good and mellow condition as you can, and plough in not half straw or muck, but solid manure, that has only compost materials enough to hold the liquids, and no more. Plough it in once, and mix it up by a second ploughing. Then harrow thoroughly, and drill it by a small plow or marker. If you have any refuse salt, a little scattered along these drills will do good. A little old rotted manure will help. Sow the seed early, the earlier the better after the land is ready, and take care that it is well covered, and the earth pressed down solid over the seed, so as to keep a uniform temperature and moisture. The seed is slow and difficult to germinate, and these conditions are essential to it. Now if you cultivate these plants well, and keep the weeds out, you may expect ten or twelve hundred bushels to the acre. Much larger crops have been raised. Nineteen hundred bushels have been obtained, and seventy-three tons were raised on Deer Island. Is not such a crop worth taking a little extra pains for? 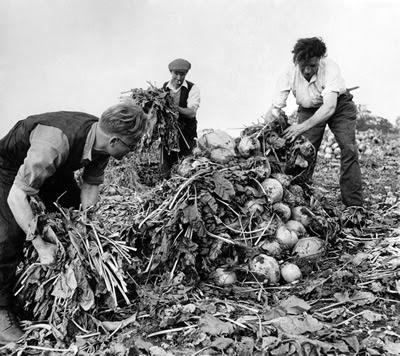 In feeding out the roots in the winter it is always best to begin with the English turnips, as they keep a shorter time than either Swedes or mangolds. They are very useful as the cold weather and stall feeding approaches, and serve to break the otherwise sudden transition from green and succulent feed to dry hay. After them will come the Swedish turnips, to be continued as long as they last, perhaps till the first of March, when it is time to begin on the mangolds. The saccharine matter in the mangolds is not fully developed till towards the end of winter, and if fed at the beginning of winter they are less nutritive and more apt to scour the cattle. They may be continued in increasing quantities daily till grass. Harvesting roots. These people appear to be making a pile of mangel roots and covering it with tops. This was a common practice. Later on the pile would be taken to barn or cellar storage, or stored in earth-covered pits closer to the barn. 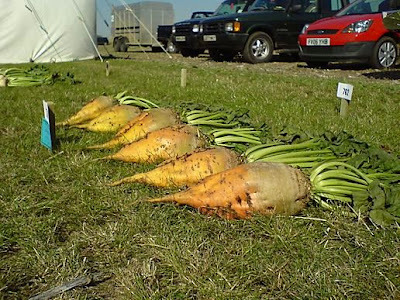 Root crops were very important in the Agrarian Nation (they are frequently mentioned in the 19th century farm almanacs), and there is renewed interest in growing these crops for animal fodder. The previous almanac excerpt offers a lot of valuable information on the subject. For more insight into this topic, I offer this next excerpt from 1864. Pictures of different kinds of roots follow. Now that's a big beet! The root crop requires great labor, unless both the ground and the manure are very free from weed seeds. But they form a most excellent and important article of feeding for stock. especially as an occasional change from other food. No farmer, therefore, can afford to neglect them. Ruta bagas and the English turnips are best fed out in the early part of winter. The mangel wurzel should be kept till later, say as late as March, before being used. Ruta Bagas.—At eighteen inches apart, in drills, or in ridges, three quarters of a pound of ruta baga seed is enough for an acre. About a pound is usually allowed on an average. Skirving’s King of the Swedes is one of the latest varieties. Mangel Wurzel.—The varieties of mangels most cultivated here are the Long Red, the Yellow Globe, and the Long Yellow. The Long Red is a very hardy root, and keeps well. It grows fast, and is usually very productive. The flesh is sometimes marbled or mixed, varying very greatly, from almost uniform red to nearly white; but the color does not affect the quality of the root. The Yellow Globe is about ten inches in diameter when fully grown, and often weighs from ten to twelve pounds. The part under ground has a yellow skin, but above ground it becomes nearly brown. The flesh is white, marked with yellow, fine-grained and sweet. The leaves are not very large and stand erect. 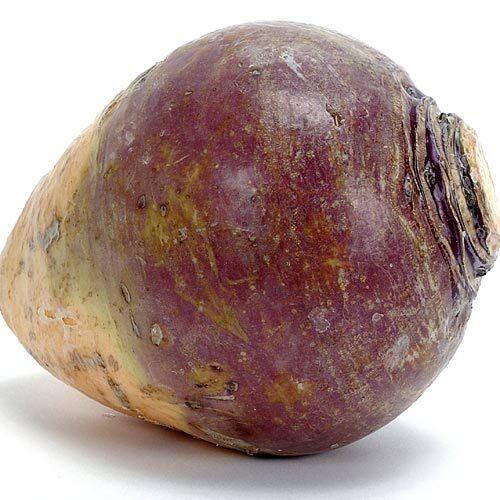 This is one of the most productive of all the varieties of beet, and is very excellent for stock of all kinds. it keeps sound and fresh late into spring, and it does not sprout as early as many other varieties. It is well adapted to hard and shallow soils. Yield from thirty to forty tons, according to soil and culture. Sow, like the long reds, in drills eighteen to twenty inches apart, and thin out to ten inches in the drills. About three or four pounds of seed are required per acre. Sow from the 1st of May to the 1st of June. Early sowings are most productive. It can be harvested with the common plough. The Long Yellow.—is a very productive variety. The roots are not smooth, but often forked into many branches. it is excellent for dairy stock, giving a rich color to the milk produced from it. The White Sugar Beet.— is a valuable variety, much grown in this country for feeding to stock, very good for the table, and when young, tender, well-flavored and sweet. It is cultivated like the Long Red Mangle, that is, sown from the middle of April to the last of May, in drills eighteen inches apart, thinned to ten inches in the drills, on deep, rich, mellow land. I grew these red mangels several years ago to feed my chickens in the winter. I can report that chickens love mangel beets. CLICK HERE to read the story. I suspect there are numerous varieties of red and yellow mangel. Johnny's Seeds now sells a Mammoth Red Mangle seed (which doesn't look very mammoth in their picture), and Yellow Cylindrical Mangel seed. For a very insightful and informative article about these old roots I recommend The Roots of Taste. 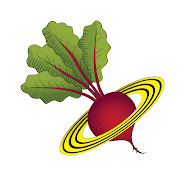 I see that Keene, New York (in the Adirondacks) has a rutabaga festival. Click Here to see Marcy Neville with a fine example of an Adirondack rutabaga. If you have experience growing and feeding these kinds of roots, or you know of a good internet link with useful information, please use the comments section here to share your experiences for the benefit of others (now and in the years ahead). Roots need to be cut up before animals can eat them. This old hand-crank Bamford root cutter was made in England. 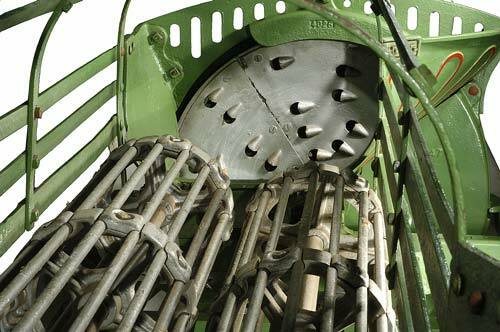 This is another style of Bamford root cutter. It is larger and driven by a belt. But the cutting mechanism is the same as the hand-driven cutter and this picture shows shows you the spinning disc with the teeth that cut the roots. Rutabagas, turnips, parsnips, carrots, beets, potatoes, all in the ground and growing well. Animal Feed for the winter, we hope! 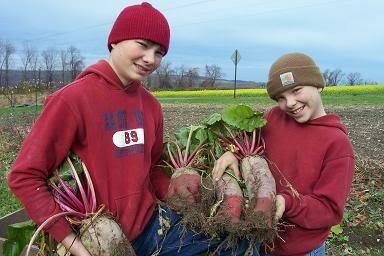 I believe the beets in your top picture are sugar beets, which generally get that big. They are grown a lot out west, in Idaho, Montana and the Dakotas. They are used to make sugar. Hello from Aroostook County! I enjoyed reading about your grandmother from Fort Fairfield. Thanks for the comment. 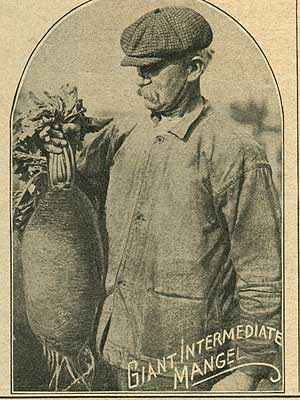 It may interest you to know that sugar beets were once grown in Aroostook County. I recall as a little boy helping my maternal grandfather, who was a potato farmer outside Fort Fairfield, pull mustard out of his sugar beet field. It was the 1960s and I remember how big the beets were. Ahhh, Washington County! I was just over that way, to Eastport. Man, those roads are getting bad. Thought the car might need some front-end work by the time I got home. Pretty country though. Can you feed mangels to horses, I wonder? I'm impressed. 1/2 acre is a lot of mangels! Have you grown them before? How do you store them? 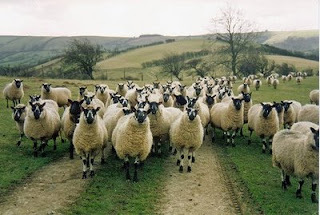 My what an excellent and most interesting blog you have in this Agrarian Nation....the photos are amazing. I have been having a great time reading through your posts. This one in particular really piqued my interest as we spend a great deal of time in the garden focused on the growing and storage of root vegetables as they comprise such a large part of our winter diet. The article, The Roots of Taste, was great. I learned something new about turnips that I did not know, as a matter of fact I would have assumed the opposite - "Early on, the power of the turnip to fix nutrients in the soil as well as extract them made them valuable in rotations. 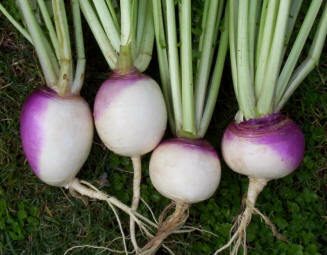 Arthur Young advised that turnips be planted before crops of wheat and rye in a season on the field." Also, other than my own experiences with beets and mangels lasting well over a year in storage while still maintaining all of their flavor I have never read anything else that hints at them being such a remarkable storage crop before the aforementioned article. Mostly, the literature at my disposal reflects a period anywhere from 2-5 months for beets in storage. Thanks for this blog...not sure how I missed it until now. I grow about a quarter acre of turnips for the cows. I start pulling them and feeding in October when the pasture gives out. To store them I pile them up and cover with a thin layer of straw/old hay/leaves, whatever and cover with soil by digging a trench around the base of the pile. A couple of piles can be linked like a chain on a slight slope allowing the water to drain away in the channels. To feed - rinse off (if they're really dirty or went into the clamp muddy) and chop in a tub using a spade. The cows can eat them whole just fine but giving them an edge helps them get hold of them better. Mangels store the same way and are much nicer. 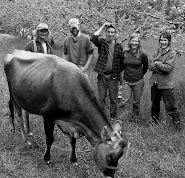 The cows LOVE them in the late winter - you don't have to chop them - but it makes it easier for the cows to eat them. I didn't get any of those planted this year though because it was so terribly wet here. Thanks for the information. I see that turnips and mangels can be used for cows - what other root crops can be used for cows? 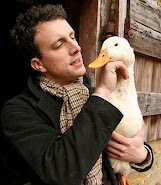 We have experimented with root crops for fodder a few years now, after doing lots of reading about old time practices (only just now discovered this blog though!) and talking to older farmers. Our hens love rutabagas, and I love their high protein content. Up to 20% or so in the leaves, and 12-14% in the roots. We left ours in the ground until the started to sprout again in the spring. Then we pulled the last of them for feed. They wintered over that way just fine! Can't wait to read more of the wonderful information here! I happened upon your site and saw some of the beautiful old photographs. I'm terribly fond of old photos myself and I edit them for friends and family by adding color to those that are in black and white or fixing up some of the damaged ones on the computer. I hope you don't mind, I added color to the one that seems to be an old logo of a man holding up a large beet. It was yellowing slightly and says "Giant Intermediate Mangel" in old-fashioned writing. If you would like to see it just email me at kristin.langston328@gmail.com. I won't charge you or ask for information or anything; I just have no way to send it to you on here in the comments. I enjoy bringing new life to old photos. It's just a hobby of mine; in no way do I intend to use your beautiful photo for personal gain or anything. Also, I made his hair and mustache blonde because it seemed lighter in the photo. If I'm wrong I can always change it for you. Just let me know. Sorry for the randomness of the situation and I hope you'll enjoy the picture. 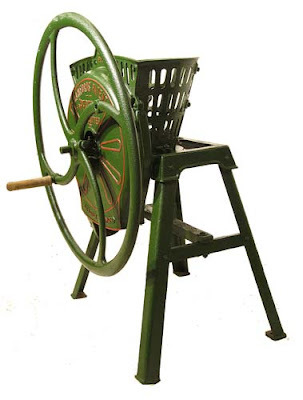 We have an old "root/beet" grinder to get rid of. Any interest?